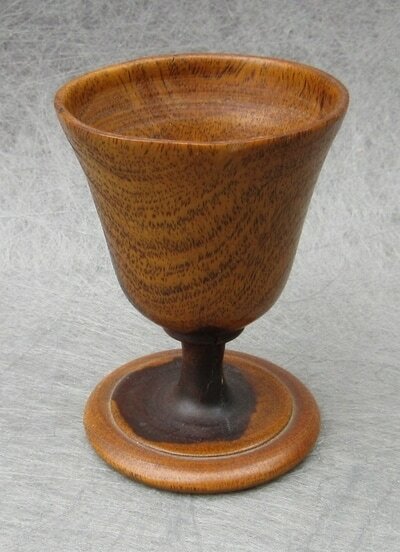 This cordial in made from lignum vitae, probably in the first half of the 19th century, owing to the amount of sapwood present in this example. It has a tiny hairline crack in the rim, but is in otherwise excellent condition. 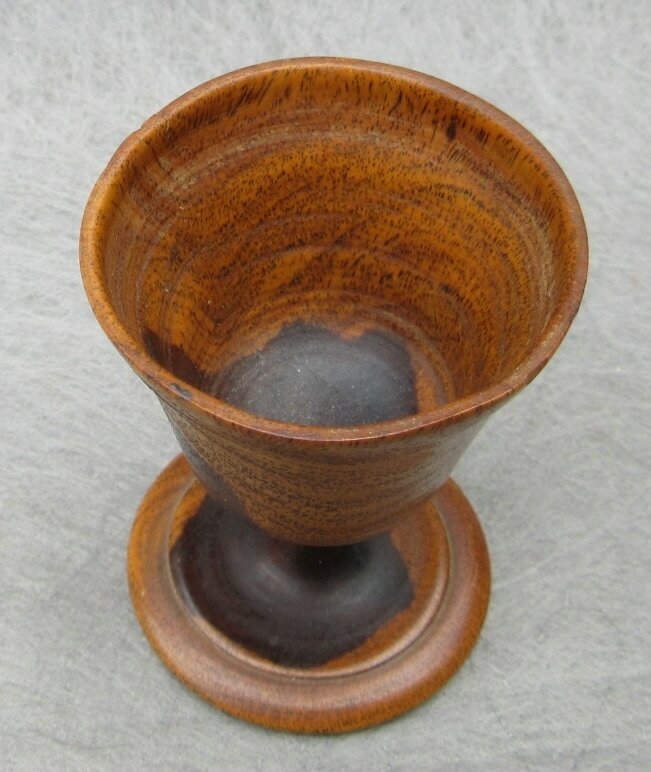 It is just under 2 3/8" tall, and 1 9/16" wide at the rim. 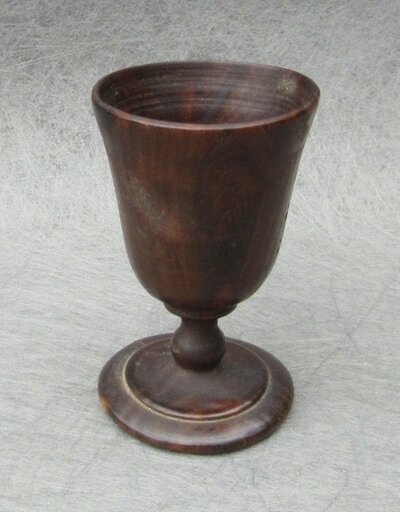 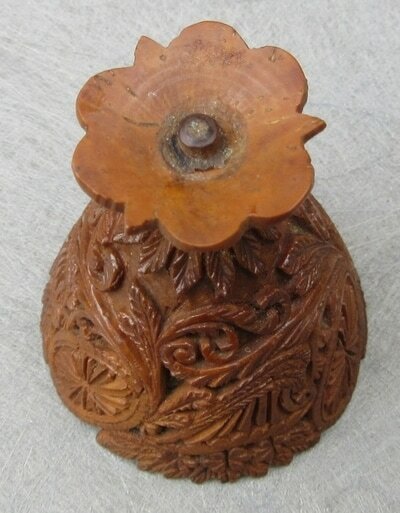 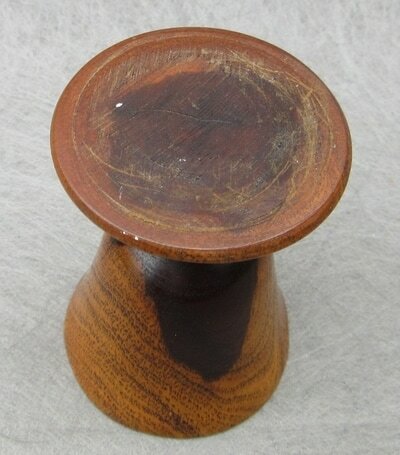 This cordial, made of lignum vitae, probably dates from the early 18th century, with it's short little baluster stem. 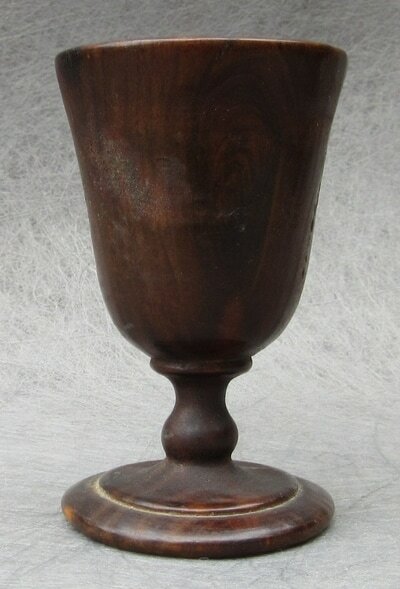 Other than warping from shrinkage and age, it is in good condition, with only a tiny crack and chip in the foot. 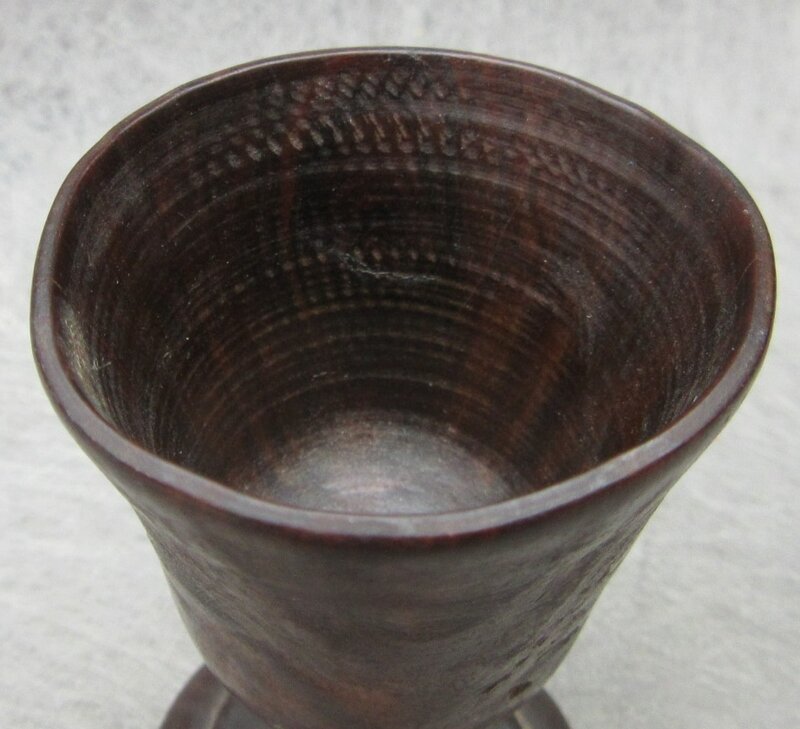 It stands 2 9/16 tall and just 1 5/8" wide at the rim. 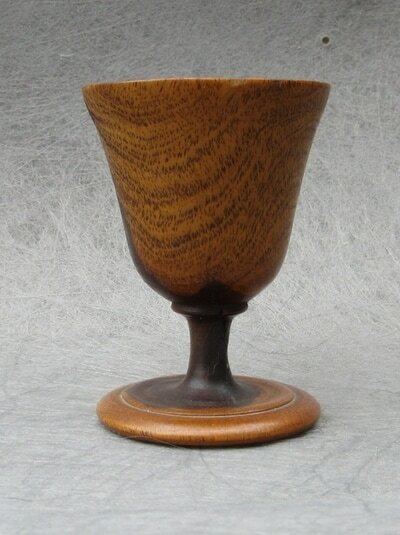 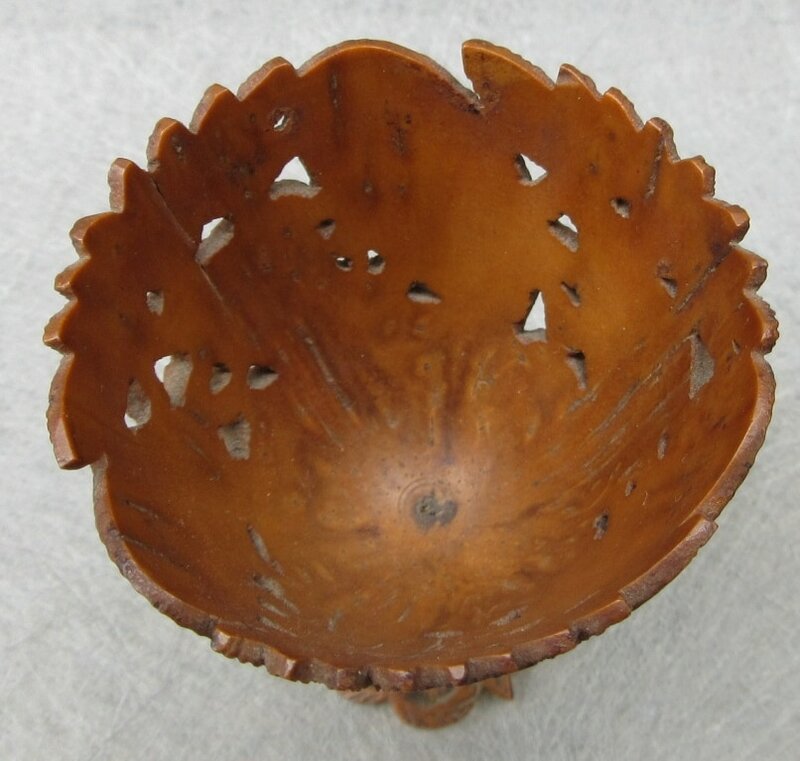 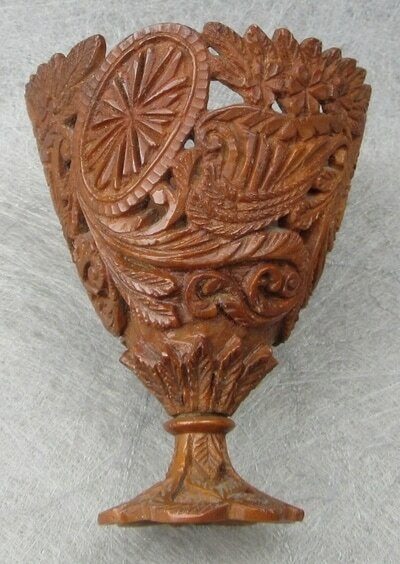 I believe this very finely carved and pierced egg cup to be late 18th century Georgian, carved from a coquilla nut. 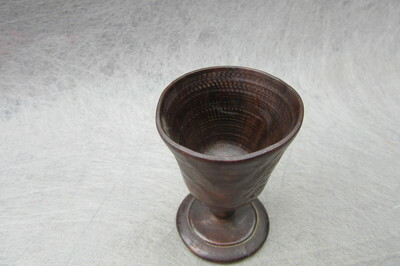 It is in nice condition, have a small crack in the lip of the cup, but no other damage. 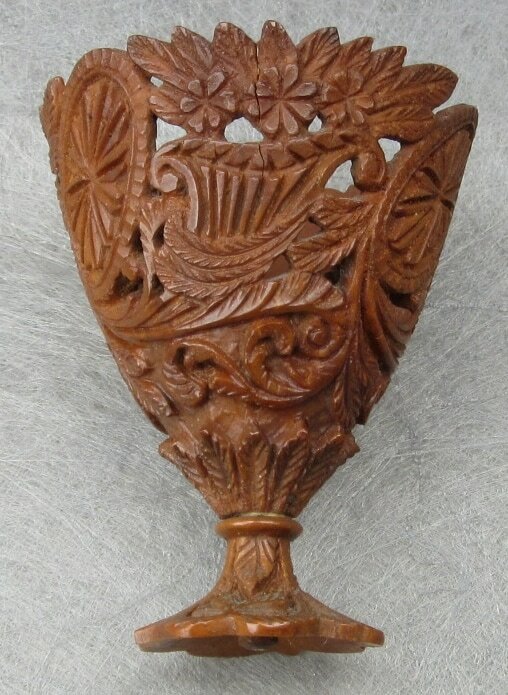 It has a repeating motif of shields and cornucopia, with scroll-work and leafage to complete the composition. This tiny cup is not quite 2 1/4" tall, and just over 1 3/4" wide at the rim. 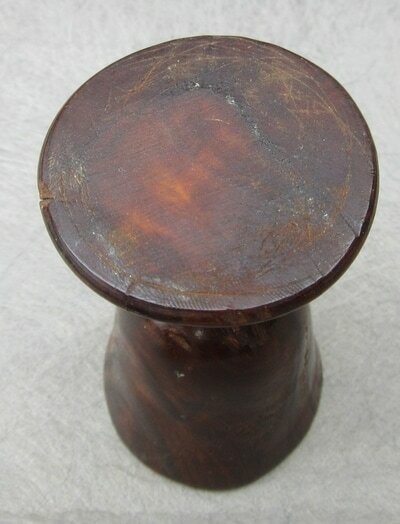 Here is a neat little salt, that probably dates from the first half of the 18th century, and is probably German. 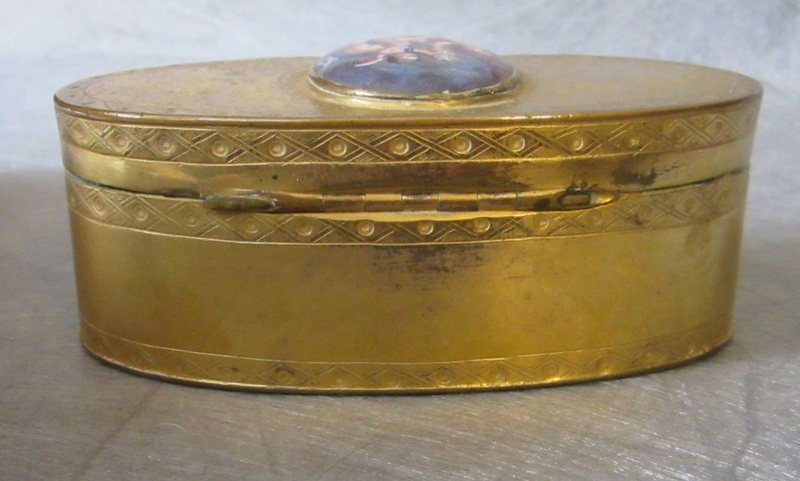 The bowl is made from agate, and is supported by a gilt brass or bronze putti, knelling on the base. 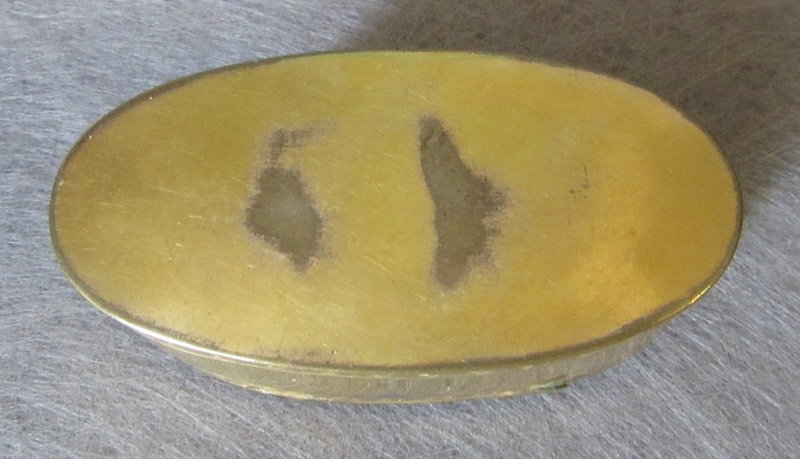 It is in very good overall condition, with a couple of small hairline cracks in the agate, while the gilded mounts are in excellent condition. This salt stands just 3 3/4" tall, and is 3 1/4" across the rim. 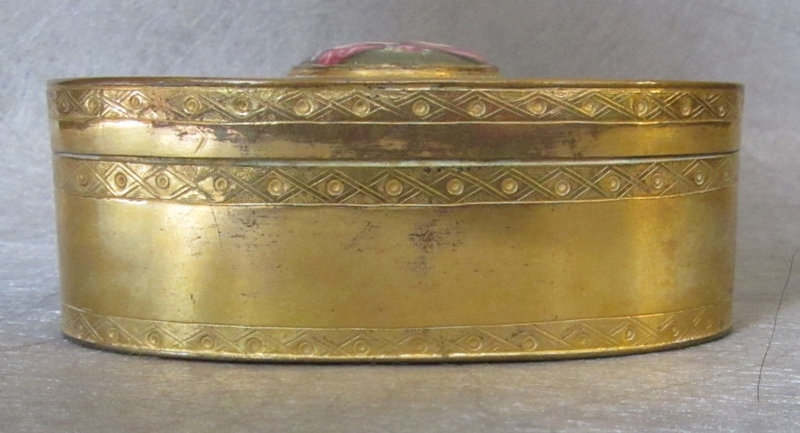 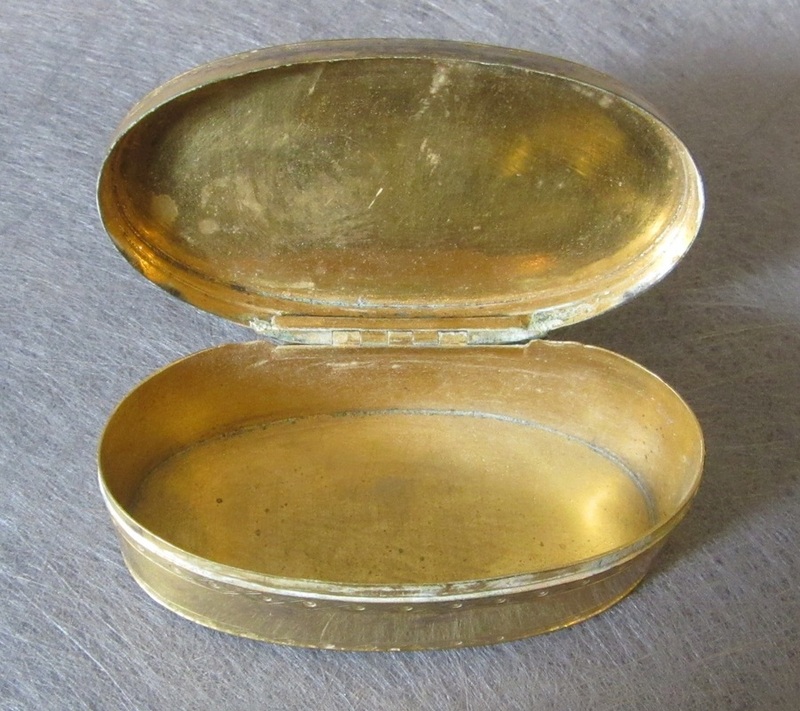 Here is a very nice fire gilt brass snuff box, that probably dates to the last quarter of the 18th century, and is probably French. 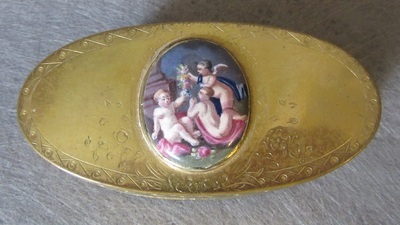 It has engraved borders, with a finely executed enameled porcelain plaque on top with cherubs in a classical scene. It is in good overall condition, with some wear to the gilding coming through in a few high spots and along the edges. The domed enamel has some wear to the surface, but no chips or cracks. 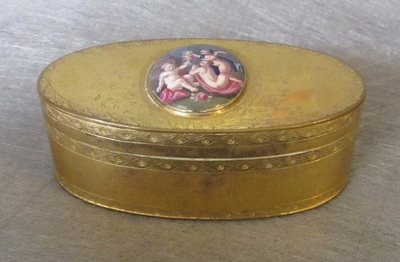 It is a heavily built box with a complex 7 barrel hinge. 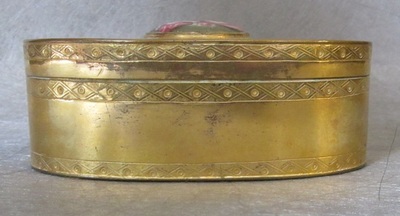 It is 3 5/16" long, 1 5/8" front to back, and 1 1/4" high.